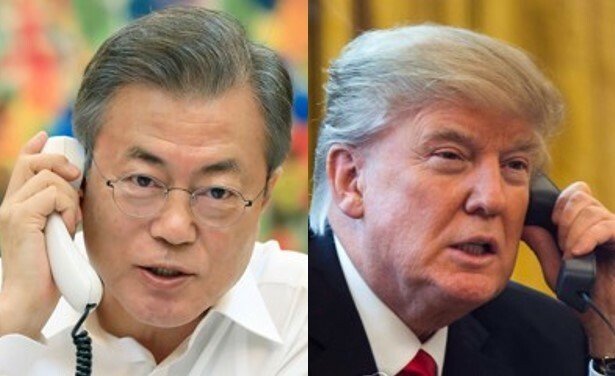 South Korean President Moon Jae-in and US President Donald Trump held a telephone conversation Thursday on the outcome of the second US-North Korea summit, which ended without agreement. The call from the US president came shortly after he took off from Hanoi, the venue of his second bilateral meeting with North Korean leader Kim Jong-un. Trump and Kim were earlier expected to sign an agreement detailing the North's denuclearization steps and possibly US measures to reward the impoverished North. The two-day summit was cut short with Trump saying he had to walk because what the North offered simply did not seem enough or appropriate. Moon's presidential office Cheong Wa Dae expressed disappointment but said the US and North Korean leaders have already made more progress than ever. Details of the latest conversation between Trump and Moon were expected shortly after their phone call, according to Moon's spokesman Kim Eui-kyeom.